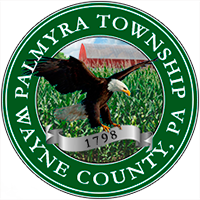 Palmyra is another of the six original townships formed when Wayne County was established from a portion of Northampton County in 1798. It was reduced in size when Pike County was established in 1814 with the Wallenpaupack Creek serving as the dividing line and the portion with the old Paupack Settlement now in Pike. Its mass was again diminished in 1850 with the formation of Paupack Township and yet again on January 23, 1884 when the Borough of Hawley was incorporated and set off from the township. Palmyra is one of the smallest townships in the county. The earliest settlements in the region were made at Wilsonville, occupying a position on what became the dividing line between the two counties, and in the area was to become became Pike County. It is believed that the first houses built in the area were on the Pike County side of the creek. Wilsonville was named after Judge James Wilson, a native of Scotland, who was one of the signers of the Declaration of Independence and, at the time the county was established, one of the judges of the Supreme Court. A man of great wealth, Wilson owned large tracts of land along the Wallenpaupack Creek on which he grew flax and hemp that he planned to use in the manufacture of fabric in the factory he erected near Hawley in 1792. Sadly the operation failed due to lack of sufficient quantities of flax and hemp resulting in the financial ruin of Judge Wilson. He died in Edenten, NC in 1798. Wilsonville was chosen as the second seat of county government in 1799. Milford was the first in 1798 but it was changed to Wilsonville for what was to be a period of not more than three years while public buildings could be erected in Bethany which became the county seat in 1805. The county seat was changed to Honesdale in 1841 where it remains today. Wilsonville became just a memory when it was flooded as part of the construction of the Wallenpaupack Dam in 1924. Prior to 1792 Reuben, Alpheus, and Alexander Jones, along with their sister Widow Cook settled below the mouth of Middle Creek. At about the same time Elisha Ames made a clearing on what later became known as the David Bishop farm, making them probably the first settlers in Palmyra Township, Wayne County. In a short time Benjamin Haines/Haynes arrived in the area. He became infamous as the murderer of an Indian named Canope to whom he had falsely offered the hand of friendship. Haines was extremely poor and his three sons had the dubious distinction of being the first children in the county who received their education at public expense under the law of 1809. This law made it the duty of the county commissioner to pay for the education of the children of indigent parents. In 1803 Jonathan Brink of Milford purchased the Haines property and erected one of the early sawmills just below White Mills. By 1815 Jason Torrey, Abisha Woodward and Moses Killam purchased a tract of land a mile from Hawley and built a frame house that they called New Castle where they ran an extensive lumbering business for several years. The property was purchased by Joseph Atkinson who later sold it to Russell Daniels from Hartford, CT. Among the early settlers at Wilsonville was Leonard Labar who kept a small tavern. He sold it in 1830 to John Roberts and Nathan Fuller and moved to Stroudsburg. A grist mill was built on the Wayne County side of the creek in 1810 and re-built by William Shouse of Easton. John R. Compton from New Jersey arrived in the area in 1803 and served as constable for many years. In 1827 Henry Harmon built a small mill near a quarry between Hawley and Wilsonville. It was named for “Mad” Anthony Wayne, a highly regarded major-general in the Revolutionary War. The original boundaries of Wayne County were, therefore, New York State on the north, the Delaware River on the east, Northampton (now Monroe County) on the south, and Luzerne (now Lackawanna) and Susquehanna Counties on the west. The population in 1800 was only 2,562 persons, a density of less than 2 persons per square mile. The County Seat was moved from Milford to Wilsonville (on the border of the Lake Region) by the Legislature in 1799, until suitable buildings could be erected, “within four miles of the Dyberry forks of the Lackawaxen River.” Dyberry Forks was the name given at the time to the junction, at what is now Honesdale, of the North and West Branches of the Lackawaxen River. Bethany became the County Seat of as a result of this legislation. A court-house and jail were erected and the court was moved there from Milford in 1805. Pike County, however, was set off from Wayne in 1814 and Milford became a county seat once more. 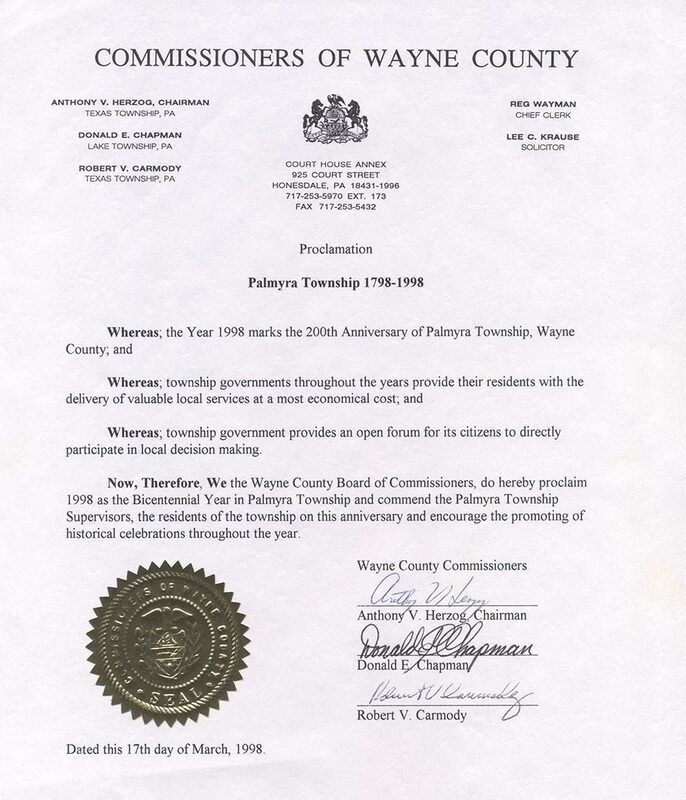 The Township of Palmyra was created through the separation of Pike and Wayne Counties. Palmyra Township was separated into two sections with this division of the two counties, the Wallenpaupack Creek being the dividing line. Later, Paupack Township was created from the remaining portion of Palmyra Township in Wayne County, leaving the current portion of Palmyra Township as one of the smallest townships within the County of Wayne. Early settlers in Palmyra Township included Daniel Kimble, who was for many years a Justice of the Peace. Another was George Neldin, who made some of the early improvements at Paupack Eddy and built the first sawmill in the region. John R. Compton, who lived on the old Milford and Owego Turnpike, was one of the first Township Supervisors. He also served as Constable. 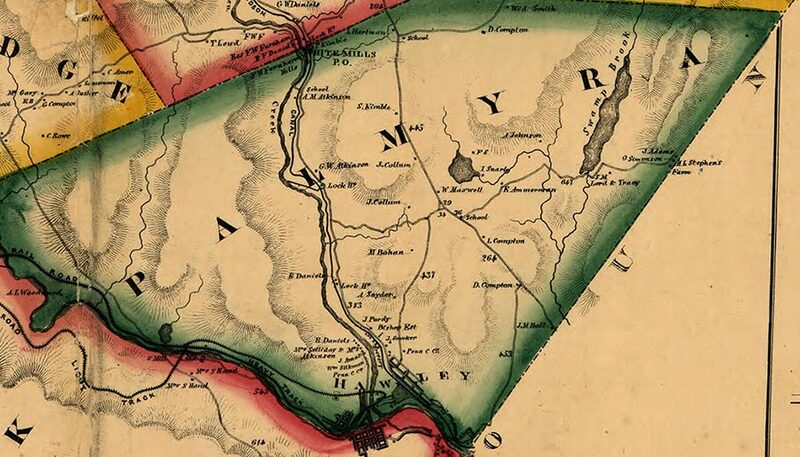 Lumbering and agricultural industries were most common in Palmyra Township in the late 1700’s and 1800. However, it was felt at that time the Township was best suited for trade and manufacturing. Many expected it become one of the wealthiest townships within the County of Wayne. Once again, the D&H Canal had a great influence on early development and, probably, expectations, as did the Jefferson (later Erie) Railroad. The Dorflinger Glass enterprises at White Mills (although mostly in Texas Township) also created numerous jobs and much attention for the area. Christian Dorflinger, the founder, was attracted to the area by the canal. The Lock 31 House, located on Route 6 (formerly the Daniels farm) remains along with several intact pieces of the canal and towpath. The property was later purchased by Ernest A. Hintze in 1878 who operated a grocery store and hotel there. The property is presently owned by the Wayne County Historical Society, which is undertaking a restoration. The D&H Canal is listed on the National Register of Historic Places. The components of the Seal | Crest represent Agriculture and Nature. The images that comprise the Seal originated in Palmyra. The corn field is from a local farm. The barn as well. Can you identify the barn ? The eagle was spotted along the Lackawaxen River.